At GSCIN we offer realistic recruitment expectations. With our ties in the community we are able to recruit potential subjects from multiple therapeutic areas and different demographics. We have a recruitment specialist available on staff to meet with and make follow up contact with potential subjects to reach maximum enrolment for each study. The recruitment staff ensures questions asked by potential subjects are answered in a professional manner to uphold protocol and not to make the potential subject feel obligated to participate. The goal of the recruitment department is to recruit subjects that want to participate and ensure subjects are aware of the compliance aspects of the study to reduce the number of subjects discontinued. 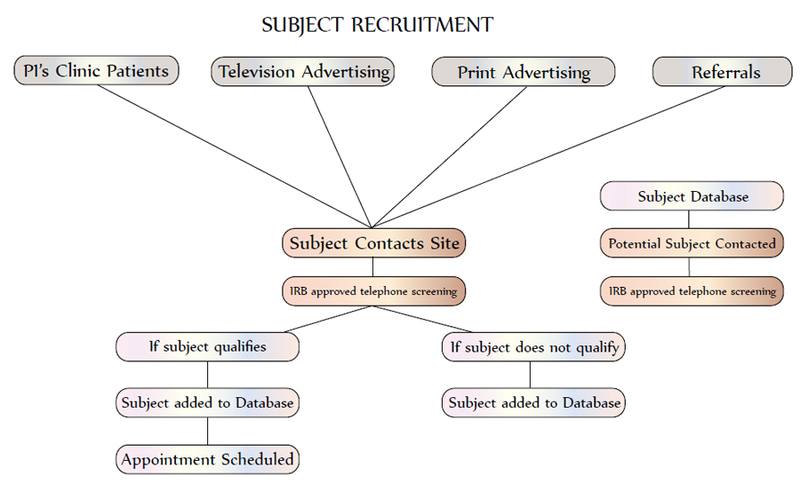 The following chart is an illustration of steps GSCIN takes to recruit potential candidates for research studies. As you can see, we have a vast database in addition to the potential subjects from the primary investigators clinic.